Hawaii is known for being a tropical paradise with amazing beaches and beautiful natural surroundings. However, a Hawaiian vacation is also known for holding tourists upside down by the ankles and shaking all the money their pockets. The main issue is that stores and restaurants in touristy areas charge sky high prices for necessities such as food – which is a bummer for foodies like us. Everyone knows that once you leave the touristy areas you can get some reasonably priced grub, but most people don’t know how the locals manage to keep expenses in check. Here are 6 tasty, unique, and inexpensive local options we discovered in Hawaii that will help you have fun and save money at the same time. Poke, the Hawaiian twist on Sashimi, consists of small, fresh (usually raw) bite sized pieces of fish that come seasoned in many tasty ways. The most popular type of poke is yellowfin tuna seasoned with soy sauce (shoyu), garlic, green onions, and sesame oil. However, there are a lot of different varieties – kimchi poke was very popular, poke with crushed and toasted kukui nuts seemed to be a locals only sort of thing, dried fish jerky w/ shoyu was at many places we visited, and there were various fish and seaweed types of poke as well. In addition to the standard tuna, options such as marlin, octopus, mussels, and crab are also available. 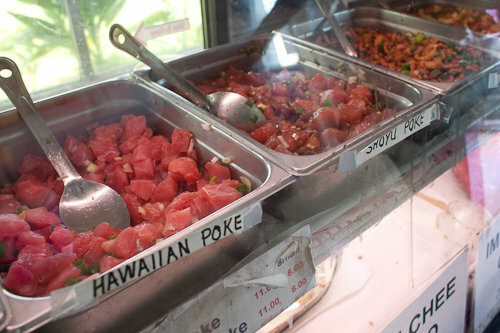 Poke can be found at supermarkets, seafood restaurants, and specialty stores. It costs about 9 dollars per pound and I bet you that 1/3 a pound is more than enough for the average person. Any sushi eater will love Poke… think of it as very fresh, preseasoned sashimi at a significant discount. Musubi are great little packets of rice that are usually wrapped in seaweed. The are about the size of my fist and you can eat them with your hands, so they are perfect for lunch on the go. Musubi are an import from Japan, where these flavored rice balls are known as Onigiri. Of course, as with most Hawaiian food, the locals have taken the original and adopted it to local tastes. 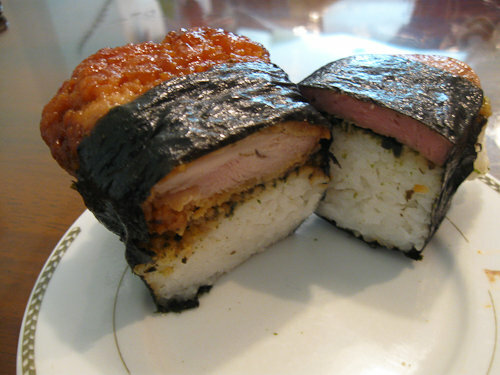 The most popular flavor of musubi in Hawaii is the Spam based one (the Spam is usually grilled and sometimes teriyakied) with the korean style BBQ chicken flavor following a close second. 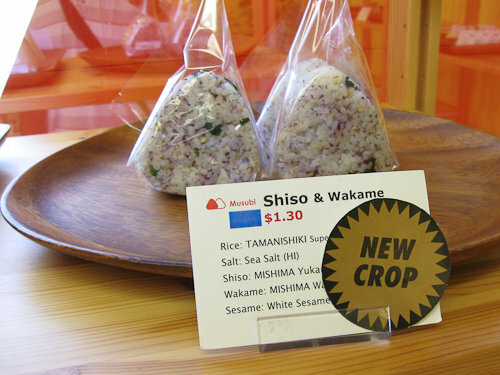 There are also more traditional Onigiri specialty shops in Hawaii – such as the excellent Manabu’s on Oahu. This place served up some amazing healthy and nutritious gourmet Onigiri at rock bottom prices. In addition to the standard Spam musubi, they serve up favorites such as spicy tuna, curry pilaf, and fish roe versions as well. Where Manabu’s shines though is in it’s healthy musubi – They use all natural ingredients like a 10 grain blend, Konbu and wakame seaweed, and shiso leaves to flavor their vegetarian / macrobiotic line of musubi. Best of all, Musubi are super cheap and they ubiquitous around the island. They can be found at supermarkets, convenience stores, and specialty onigiri shops for about $1.50 to $3.00 depending on the size. Two large or 3 small musubi are more than enough for a quick lunch. With a name that means “mucus crazy ” in Spanish, you wouldn’t think this Hawaiian original is very appetizing, but it is surprisingly delicious. Loco Moco has 4 basic ingredients: fried eggs, a hamburger patty, rice, and gravy… not good for you but definitely delicious. Rice goes surprisingly well with hamburger and the gravy brings the whole dish together and adds some great flavor to the rice. Legend has it that some poor students invented loco moco one day at a local grill when they didn’t have enough money to buy a real menu item. Apparently their friends also started ordering the dish and loco moco quickly spread throughout the islands once the word was out. There are many varieties of Loco Moco (some use fried rice instead of steamed rice or a meat other than a hamburger patty) but I stick to the tried and true original. The Loco Moco pictured above is from L & L’s and is served with macaroni salad, which is a ubiquitous side dish in Hawaii. *** UPDATE *** – forgot to mention that the loco moco is pretty huge and will fill you up. In fact, I just saw a version of the loco moco featured on Man v. Food! If you are on the island of Oahu – GO TO LEONARD’S BAKERY. They have the most amazing malasadas, which are fresh, Portuguese style fried donuts without the hole. They are much softer and fluffier than donuts though because they are a bit thicker. Malasadas come powdered with sugar with optional flavored cream and custard fillings. Apart from the original, my favorite flavors were the custard and coconut (haupia) filled malasadas. Many others I know like the Li Hing (dried plum powder) flavor as well. Leonard’s is an extremely popular spot so be prepared to wait up to 10 minutes to place an order and bring some friends, because it’s much cheaper to buy malasadas by the dozen. 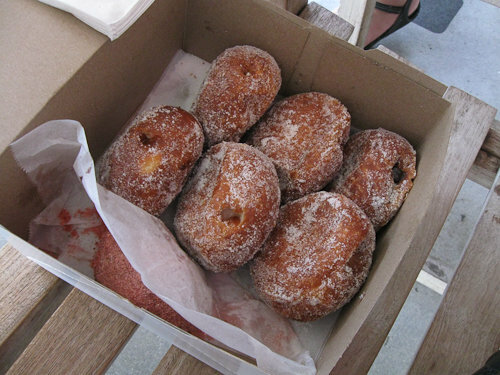 Best of all, the price of a single malasada is about 80 cents so you can eat to your heart’s content without spending a lot. 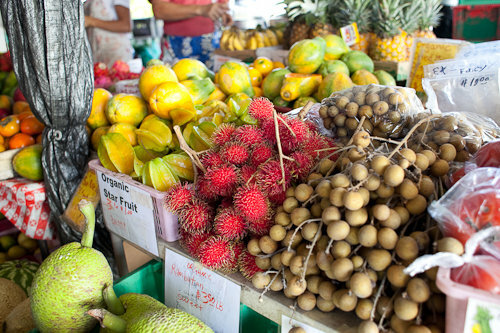 There are great little Farmer’s markets all over Hawaii that provide fresh, local produce. 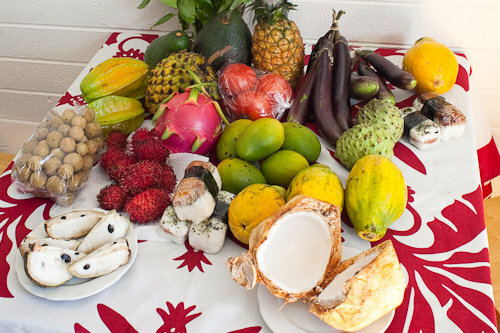 There are all sorts of delicious fruits year round, and many of these are surprisingly cheap. When I went to the Hilo Farmer’s Market in November, the going price for good sized organic star fruits was 3 for $1.00, and papayas were 5 for $1.00. This fruit isn’t the stuff you are used to eating stateside either… these are vine ripened fruits picked just a day or two before… making a whole world of difference when it comes to taste. Between 5 people we ate 30 papayas in 5 days…. and no we did not get tired of papaya, the fruit in Hawaii is that good! Yes all of the rumors about Hawaiians eating a lot of SPAM are more than true. 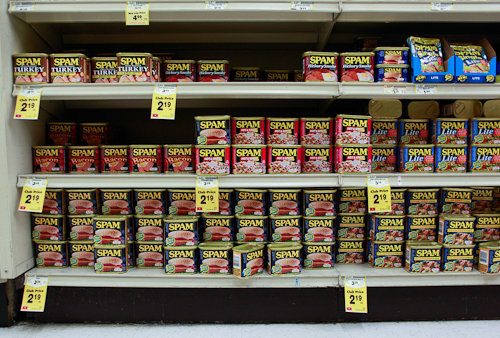 Just take a look at this photo of the SPAM aisle at the local grocery store. Who knew that there were at least 7 different varieties of SPAM? Also, for some reason SPAM seems to be the cheapest thing in the whole store… 2.19 for a can? You can’t even get half a loaf of bread for that much in Hawaii. 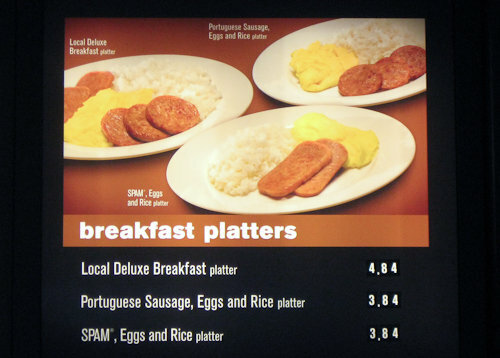 If you had any more doubt about the popularity of SPAM, McDonalds serves a special Hawaii market only SPAM breakfast (with eggs and rice) for $3.84. And get this, instead of ketchup, they give you 2 packets of soy sauce on the side. I have to admit that I tried SPAM one other time in my life (when I was camping as a boy), so I was a bit apprehensive about eating SPAM while in Hawaii. After my trip though, I have to report that SPAM is pretty delicious if prepared correctly. I had it grilled, grilled with terriyaki sauce, with eggs and rice, in a bowl of noodles, wrapped in sushi… all of the options were pretty darn good. I think I’ll keep SPAM as a Hawaii only thing though because for some reason everything tastes better on vacation, and I just don’t think it would be the same back home. Also, I’m pretty sure that SPAM is pretty terrible for you and the mystery meat aspect will prevent me from eating it on a regular basis. That said, I highly recommend trying SPAM at least once while in Hawaii both for the novelty value and to keep costs down. 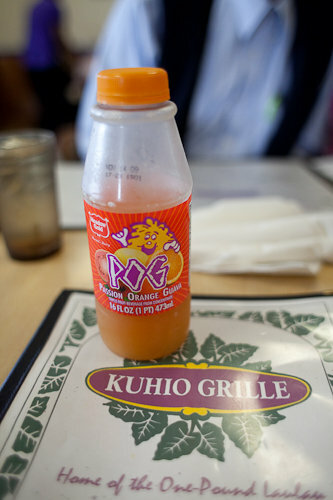 While it’s not a food, when in Hawaii you should seek out POG, a drink made of passion fruit, orange, and guava juices. It’s delicious, it’s local, it’s cheap, and you can’t get it stateside. Happy Tasting, I hope this post helps you save money while discovering local treats on your trip to Hawaii! i love spam. my dad does something with them with vietnamese ham and tofu. actually he has two recipes with those 3 recipes that i love. i wish i could tell you what he does… but spam is yet another reason for me to want to go to Hawaii. thanks for letting me live vicariously through you, peter. Your blogs always make me hungry, Peter. Thanks for the tips. I am going to Oahu in a couple weeks and am really glad I stumbled on this so I know what to look for! Any suggestions for farmers markets or places to eat on Kauai? We didn’t get to go to Kauai, but I would say for sure eat as much poke and dragonfruit as you can 🙂 Also, the custard apples are amazing.